Visualization of the ‘Star Wars’ anti-missile shield, part of Ronald Reagan’s proposed Strategic Defense Initiative. Donald Trump surprised his staff at a press conference this week by verbally instructing the Pentagon to create a new branch of the U.S. military. It’s unclear what the President imagines a Space Force to be. Imperial stormtroopers, perhaps, marching down the National Mall as part of a military parade? What is clear is that no Space Force will actually be created. The Pentagon doesn’t want one, Congress doesn’t want it to have one and the written directive that Mr. Trump signed at the press conference makes no mention of a Space Force. Instead, it recommits the United States to a very different policy. That policy is to exercise strategic restraint in space, because everyone who understands that domain – from U.S. generals to defence contractors to private satellite companies – is terrified by the risk of runaway space debris. At first glance, satellites might seem like tempting targets. Militaries use them for reconnaissance, communications, high-precision targeting and the operation of drones and “fifth-generation” fighter jets. Destroying just a few satellites could disable the entire armed forces of an enemy. 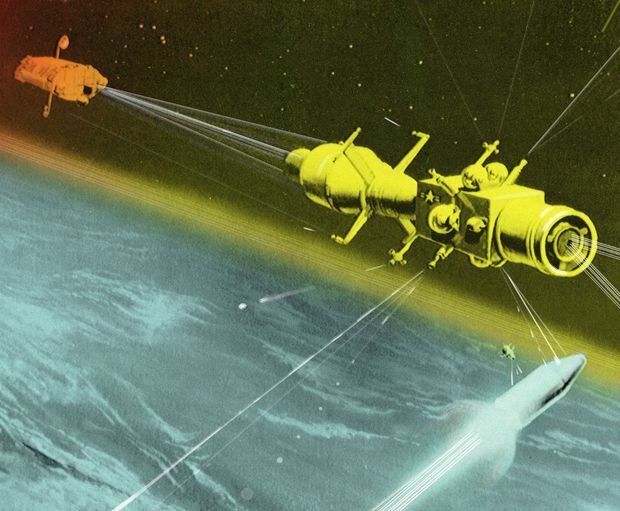 During the Cold War, several types of anti-satellite weapons were developed, including ground-based missiles and space-based “killer” satellites that could be steered into high-speed impacts. The problem with these weapons is that a single strike can create thousands of pieces of debris. These pieces then orbit the Earth at speeds of up to 28,000 kilometres an hour, with relative speeds – with respect to other satellites – of up to twice that. Larger pieces can be tracked by ground-based radar, enabling evasive action. The International Space Station has been boosted out of the way of debris on at least 20 occasions. But even a tiny paint fleck can be deadly at such very high speeds. In 2007, China tested a missile against a defunct satellite. The impact created approximately 35,000 pieces of debris larger than one centimetre, plus countless smaller pieces. Six years later, one of those pieces destroyed a Russian satellite. The greatest concern is that debris from one collision increases the risk of further collisions, and therefore more debris, and so on. Called the “Kessler syndrome” after the NASA scientist who first identified the risk, runaway space debris could render key orbits unsafe for satellites for centuries. Runaway space debris threatens literally trillions of dollars of investments in military satellites and related ground-based equipment. Entire weapons systems, including the F-35 fighter jet, could be compromised. Indeed, civilians everywhere depend on satellites for weather forecasting, global positioning systems, aircraft and ship communications, financial services, agriculture, forestry, fisheries, environmental science, search and rescue and disaster relief. Even a limited conflict in space could have massive consequences for the economy, food supply and human security. The risk of runaway space debris is so very serious that countries have changed how they behave in space. Since 2007, no anti-satellite weapon has been tested in a manner that could cause space debris. In 2008, when the U.S. shot down a malfunctioning satellite that was falling back to Earth with a large amount of toxic thruster fuel on board, it waited until the satellite reached a very low altitude where no space debris would result. The United States, Russia and China have redirected their anti-satellite weapons research into “non-kinetic” methods such as lasers, jammers and cyberattacks, none of which create space debris. They are also researching methods for reducing and removing space debris. The European Space Agency is studying how to de-orbit derelict satellites, including with special spacecraft that could capture satellites with a net or robotic arm and steer them toward atmospheric re-entry. NASA has similar research projects. In 2016, China went so far as to launch the Aolong-1 spacecraft, which is designed to collect space debris. The United States, Russia and China have even introduced regulations on the prevention of space debris into their domestic legal systems; regulations that bind national space agencies as well as private companies. The directive that Mr. Trump signed this week reaffirms this policy of strategic restraint. It directs U.S. federal departments and agencies to co-operate with other countries in the monitoring of space debris, the development of new technologies to prevent space debris, and the creation of new domestic and international rules. Donald Trump wants a Space Force, but he won’t get one. This week, in a scene that could have come from Monty Python, a clueless president boasted about dramatic and destabilizing intentions – while signing a document that contradicted and therefore blocked them.